Nashua Nutrition specializes in high quality weight loss and bariatric products. A tailored approach to losing weight, the Center for Medical Weight Loss is a medically-supervised weight loss plan with locations throughout the country. A successful alternative to the gastric bypass surgery, the LAP-BAND is placed around your stomach to help you eat less and lose weight. Unlike gastric bypass, LAP-BAND is completely reversible. With a line of vitamins and minerals for weight loss surgery patients, Celebrate Vitamins offers specialized supplements for specialized nutrition needs. Zerona offers an effective, non-invasive liposuction treatment to lose inches from those problem areas without any pain or down time. Over the course of the past decade, Bariatric Surgery has grown in popularity and recently become quite common, especially as a final attempt for weight loss when all other options have been exhausted. The Revival Slim and Beautiful Diet was created by Dr. Tabor as an inside-out whole weight loss and makeover regimen. With its own line of healthful meals and snacks and a regimented exercise plan, it can help you to find weight loss success. The Revival Slim & Beautiful Diet, created by son-mother team Dr. Aaron Tabor and Suzanne Tabor, says most users see weight loss of nearly 30 pounds in 16 weeks. Realize is an adjustable gastric band that can help you lose weight as you follow a healthy eating plan and a long-term weight loss support program. Isopure Shakes are an ideal supplement for either meal replacement or for additional nutrients and protein following a workout. Courtney Love lost 40 pounds with Isopure- how about you? This is a great twist on refried beans. Tons of flavor and cheese makes this dish a hit. Mr. Roger Berry, bariatric surgeon of Complete Weight Loss Surgery, gives a presentation on laparoscopic gastric banding as treatment for morbid obesity. A well-respected study finds gastric lap band surgery may actually be a cure for diabetes. This CBS report introduces how plastic surgery helps post-surgery gastric bypass patients regain their bodies and their lives. The Wellness Hour interviews Brian Quebbmann, MD, who discusses weight loss surgery. This episode includes a tour of the weight loss center, patient stories and an exclusive one on one interview with Dr. Quebbmann. Check out the results and testimonials of a few people who have had the Lap-Band procedure, and successfully and safely lost hundreds of pounds. Diabetic talks about Mini-Gastric Bypass with Dr. Rutledge. Since the surgery her blood sugar remains low and she's off her diabetes medication. 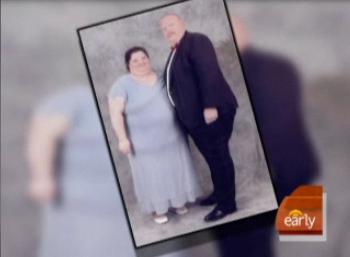 A married couple each lose hundreds of pounds through weight loss surgery - she through the gastric band and he through more traditional gastric bypass.